A woman crosses the state lines and heads to a building. She steps inside. It is full of pot plants. She gives a man cash and leaves with boxes. She gets back in the car. Her kid is in the back seat sleeping with a pillow or blanket. They hit a bump and blow a tire. She gets out and starts to change the tire. An officer stops to offer her help. He sees the boxes. One of the tops has blown off. There are hundreds of vials with marijuana plants printed on them. Benny leaves the shirt and sees his mother’s friend. They walk and talk. She needs his help. Her daughter is being held for possession of marijuana oil vials. Benny meets with Bull. He talks Bull into taking the case. The next day, Benny and Bull go to see the woman’s daughter at a Virginia jail. Her daughter is a doctor. Bull and Benny speak with the young red-headed Dr. Allen before she is hauled away to her cell on 27 counts of possession with intent to distribute. At the office, Bull talks to Benny and Marissa. 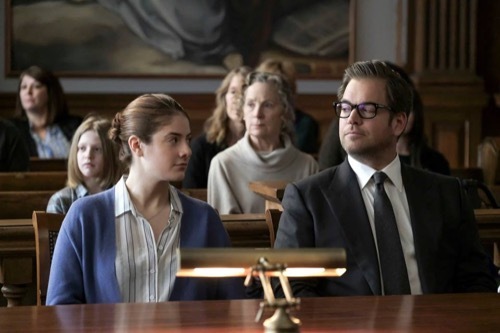 Bull wants to find a jury that understands Allen had no choice but to help her patients. Bull wants to find a juror pool of professionals who will do their best no matter what are the consequences. At court, Benny searches through the juror pool asking them questions about their job. The Assistant US Attorney asks her own questions too, showing that there is fine a line between the jurors they both want. Bull and Benny meet Dr. Allen’s young son and her mother outside of court. After they leave, Benny tells Bull that her son has leukemia. In court, the Assistant Attorney paints a picture of Allen as a reckless mother who gives oil to her young son and patients. Bull’s team appears to be losing the race. They head back to the office and hold a mock trial for Allen so she can practice what she needs to say to the jury. She tells Benny and Bull how her 11-year old was once suicidal. He lost so much weight and couldn’t get out of bed. After giving him CBD oil he improved greatly. Bull brings the doctor home. She offers to make them both a drink. Inside, they say hi to Allen’s mother and Nick her son. A knock comes. Allen answers. It is the police. They are there to take Nick to the hospital for observation. At the hospital, they wait. Bull tries to talk her into leaving. They have court in the morning. She won’t budge. She is angry. She is on trial for trying to make her dying son feel better. Bull offers to call someone who can stay with her. She just wants to be alone. The next day in court, Bull and Benny, as well as the rest of the court, wait for Allen to show. She is over an hour late. She calls Bull. She tells him that her son ran away from the hospital and they didn’t even know he was gone. She is out searching for him. She finds him at the park. They return to the hospital. The doctor comes in. He is impressed with Nick’s health and Allen’s treatment plan. He tells Bull he would be willing to testify. Bull and Allen go to visit the judge in his chambers. He doesn’t care what they have to say. He has Allen brought to the jail until her hearing the next morning. Bullheads to the office and gives everyone on the team a job to do to help with Allen’s case. In court, the doctor from the hospital takes the stand. Benny cross-examines him. He tells the court Allen’s plan for her son is excellent. He asks if he can share a story with the court about his mother and her cancer. It moves the jurors into the green. Benny introduces 13 of Allen’s patients who have been treated with the CBD oil. The Assistant Attorney is angry. She wants to vet the list of witnesses. The judge asks them to approach the bench. Two seconds later the court is done for the day. Bull finds the Assistant Attorney at a bar down the street. He tries to strike a deal with her but she isn’t giving in. Even though she feels for Allen she needs to uphold the law. She took an oath. Bull, Benny, and Marissa meet back at the office. They need to empower those remaining jurors, Bull tells them. In court, Benny gives his closing argument where he talks about the law not being as cut and dry as they might think. It differs in New York from Virginia. What also is not cut and dry is Allen’s obvious compassion and the care she gave her clients. The jury finds Allen not guilty.